ADHI Model 45 Berlin Sump. Rated for aquariums up to 225 gallons.36-inches x 16-inches x 18-inches (LxWxH). Includes dual 1-inch barbed connection for drain line. First divider wall height 10-inches. Skimmer chamber 15-1/2-inches x 12-inches. 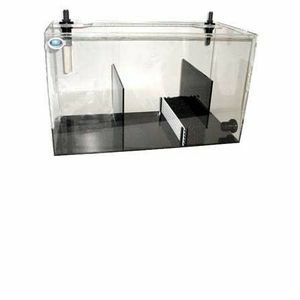 Sump chamber 15-1/2-inches x 14-inches. Pump chamber 15-1/2-inches x 6-inches. Will fit ASM G-2 & G-3 protein skimmer. Skimmer chamber fits most drop in skimmers. Max flow 1200 gph. Made out of 1/4 Inch Cast Acrylic Construction. 3 Year Warranty.